Home/Technology/4 Tech trends which will dominate the market in 2017 – Which one would you invest in? If you take a close look at the technology that we have at our disposal, you will be rather amazed and surprised. It is indeed astonishing that you can now retrieve any information under the sun and communicate in a wide array of ways using just a device that is kept in your pocket. Once you have a smartphone, you can have the entire world in your palmtop. In the world of technology, there’s always something new and we just can’t help but discover them so that we get to know its tech wonders. Every year there are some trends which catch on. While we’re almost about to complete 2017 and there are just 4 more months left to it, let’s take a look at the most vital tech trends which were in store in 2017 and which are also going to remain for few more years. 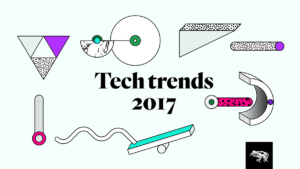 Let’s take a look at some such tech trends for 2017 and beyond. All of us have been hearing about the revolution that the Internet of Things will create and as a result of which we’re about to get an interconnected home. So, what is the ultimate secret here? Why are we still waiting to reside in smart and connected homes? The main issue lying here is too much of competition with less collaboration. There are too many individual appliances and apps on the market but in reality there are not many solutions which can tie everything together offering a seamless experience for the users. However, now since the bigger giants like Google, Apple and Amazon are joining the bandwagon, we may expect better advancements in this field. In the last few years, machine learning has taken few fast steps to move forward and it even emerged to enhance the main search engine algorithm of Google. Nevertheless, we have seen this in a controlled range of applications. Throughout the entire 2017 we have seen various machine learning updates emerge through the board entering any consumer application. It won’t take much time for machine learning to become normal. We have seen various steps to be taken for both Virtual Reality (VR) and Augmented Reality (AR) technology in the previous year. With the release of Oculus Rift and the positive response of people, there are different other things like VR games and apps which followed later on. There was also AR game and Pokémon Go which created ripples in the market with more than 100 million downloads. So, it seems that the market is ready for VR and AR and we’ve got some tech devices which are ready to accept these. Once they start accepting, you have to be ready for the VR and AR versions of almost everything that you see. Big data has become an indeed huge topic for the last 5 years and since then it has started being the buzzword. The main idea behind this is that a large quantity of gathered data which we have access to can help alleviate the stress of planning better health treatments to creating better marketing campaigns. In 2017 we are already seeing advances of humanizing big data seeking more qualitative data and showing it as more visualized. Therefore, if you’re wondering about the different tech trends that are going to dominate the market in 2017 and beyond, you can take into account the above mentioned tech trends.